Kitten with a Whisk: Yo quiero Quesadillas! I have a deep love for Mexican food. A better word might even be addiction; I have an addiction to Mexican food. The other night I rifled through my fridge and pantry and discovered that I had all the necessary ingredients for Veggie Quesadillas. I’m a fan of the homemade quesadilla, much more so than ordering them in a restaurant because when you make them at home you get to choose what you want in them and the possibilities are endless. A while back I use to be afraid of making them, but once I learned how easy it can be I make them at least once a month. * I can’t really give you exact measurements because that is all up to you. Below is the method of how to go about making them. 1 -Sauté your veggies until al dente. FOOD 411: Al dente means “to the bite”, it refers to that tender yet crisp phase of vegetables but is more commonly used referring to paste. 2 -Heat a large sauté to medium heat and pour just enough vegetable oil to coat the bottom of the pan. Place the tortilla on the pan. 3 -Add a layer of cheese all over the tortilla but leave about a half inch perimeter from the edge. Next scatter some of your veggies all over the tortilla. You can add as much as you like but don’t worry about covering every inch with vegetables. You’ll be folding it in half. (See picture) Even though I didn’t overload mine with veggies, I still ended up with a ½ inch thick quesadilla. 4 -Once the cheese start to melt slightly, take a pair of tongs and fold the tortilla in half and press down slightly with a spatula. 5 -After the tortilla has browned slightly on the bottom side, flip over carefully to finishing browning the second side. 6 -Remove from pan and allow cooling for a couple of minutes before slicing. 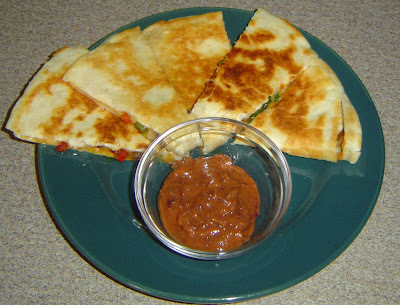 My thoughts on this dish: I love quesadillas and these hit the spot. They are crispy, melty, and full of tasty veggies. Not to mention quick and not a lot of dishes to clean afterward! The dipping sauce in the picture is one of my favorite things. It’s Spicy Black Bean Dip from Dessert Pepper Trading Company. It’s a staple in my fridge at all times; I especially love it on southwestern style scrambled eggs.